Your persona is the part of you that others see. As a classroom teacher, your front-of-the classroom persona—the way you present yourself to your students—will be very different from the way you behave in quieter settings, such as eating lunch with colleagues or hanging out with friends and family. 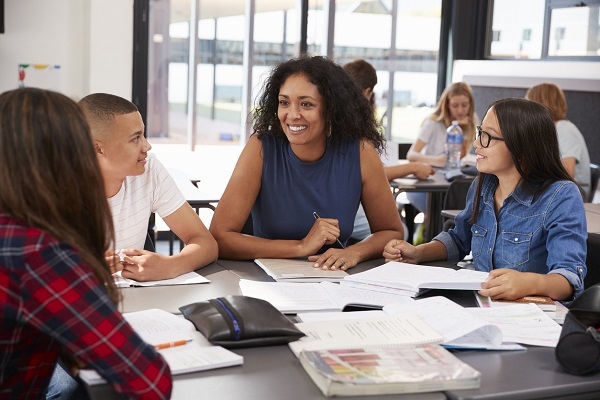 If you think about teachers who made a positive impression on you when you were a student, you can probably recall specific character traits that enabled them to connect with you and that helped influence you and your classmates in beneficial ways. Effective teachers are aware that it is important to deliberately develop a persona for themselves if they are to be the capable classroom leaders their students need. Obviously, it would be a disservice to you and to your students if the persona you present to them was not authentic. You should not assume a false role, but you should think about the way you want your students to view you as their teacher. Here are some characteristics you may want to consider as you determine how best to present yourself to your students. Be professional: From the way you greet students to the way you dress to the arrangement of the furniture in the room, you signal to your students that you are professional in your approach to your responsibilities. Your actions should indicate that you are a trained, knowledgeable and confident educator. Be enthusiastic: You should project an energetic enthusiasm for your subject matter, for the day’s instructional activities and, most important, for your students’ academic success. Your enthusiasm will ignite your students’ enthusiasm. Be focused: Having a focused approach to the way you instruct your students will make it easier for them to concentrate on learning instead of veering off task because you will serve as a role model. Strive to be as prepared and organized as possible before class begins so that you can focus on teaching while you are in class. Be inclusive: When you ensure that all students are involved in the lesson and that you care about their success, you send a powerful message. The way you move around your classroom, your body language, and the way you speak with all students combine to help the kids feel that they are part of a classroom community. Just as you should make your classroom into an inviting place for your students, so, too, should you make your persona inviting. Be courteous: Your students will carefully observe every action you take as a teacher, day after day. This can be unnerving at times, but one important side effect of this scrutiny is that it gives you the opportunity to model the courteous behavior you want from your students. Modeling kindness, consideration for others and courtesy are all actions that will offer long-range rewards for you and your students. Be patient: No teacher should be a pushover, but being patient with your students will make your classroom atmosphere positive and productive. Teaching students how to deal with their own mistakes is one of the greatest gifts that a patient teacher can offer students. Being aware of the power in a teacher’s words to either hurt or heal will make it easier for you to think twice before being sarcastic or impatient with your students. Be caring: Effective teachers know that the relationships they forge with students are the key to a harmonious classroom and successful students. Don’t be afraid to let your students hear you say that you enjoy being around them and find them to be worthwhile, interesting people. Showing genuine concern about their well-being will enable the trusting relationships that you want to develop. Be understanding: No matter how much older you are than your students, it is a good idea to learn to see the world as your students do. Being understanding about the struggles they may face at home before coming to school will make it easier for you to offer help, for example. So will developing a knowledge and appreciation of the things that grab their interest—from music to sports to clothing to social media and beyond. Be willing to have fun: No one expects you to make every school day an exercise in over-the-top entertainment, but students do want to have fun as they learn. Luckily for teachers everywhere, it is very easy to have fun in class. Low-tech games, quick video clips, inside jokes, class rituals, and assignments that get students out of their seats and talking with each other are all easy ways to have fun and learn at the same time. Be fair: Having a reputation for being fair is crucial for a teacher. A sure way to create discipline problems is to treat students unfairly. Even very young students are quick to notice actions they perceive as unfair and to react accordingly. Your students will be far more willing to cooperate with you and with each other if they feel that you regard them as worthy individuals with a right to be treated well. Be positive: Of all the traits you should consider as you develop your front-of-the-class persona, being positive is the most important. If you want your students to be positive about learning, about their class, about you and about their ability to succeed, then you must first make your own positive attitude about them explicit. If you are a cranky and negative teacher, you can expect your students to reflect that undesirable approach to their schoolwork. Fortunately, the alternative is also true: When you project a positive expectation that your students will succeed at what you ask of them, then you are highly likely to encourage them to persist when they meet challenges.